New Zealand has very unique location on planet. It is situated in the middle of Pacific Ocean on so called “Ring of Fire”, exposed to all weather patterns oceans can throw at it and thanks to its undisturbed seclusion for millions of years a natural, scenic wonderland had a chance to form. New Zealand has become a destination with perhaps some of the most diverse, wild and colourful landscapes on Earth. Quite possibly for this reasons, it is a dream destination – once in a lifetime experience for many people. South Island with West Coast in particular is an absolute heaven for any landscape photographer, offering such a remarkable diversity on so small piece of land, which is unparalleled in the World. 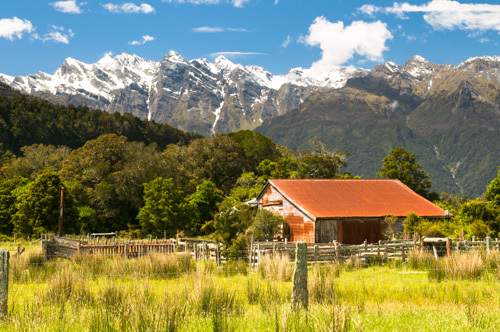 In total, New Zealand has 13 National Parks. 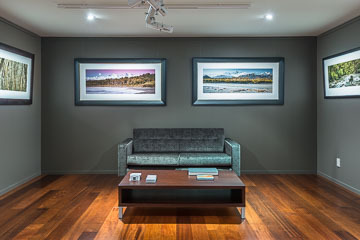 3 are up in the North Island, 1 is in Rakiura/Stewart Island and 9 NP are on the mainland/the South Island. Out of these 9 NP of the South Island, we are going to shoot in the Westland National Park with its remarkable sceneries outlined below. There will be other Reserves of special significance in which the photo shoots will take place. 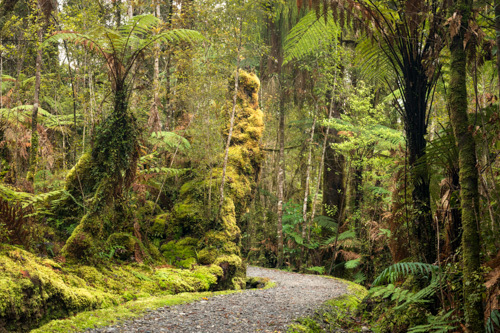 Westland National Park is one of the most diverse of all National Parks in New Zealand. It is situated approx. 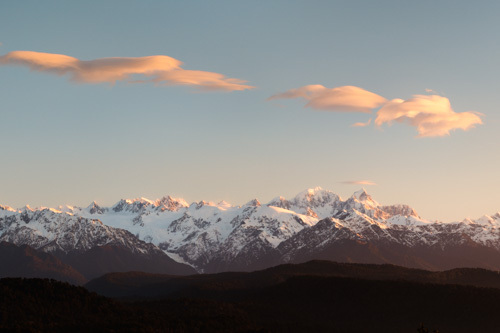 in the middle of the West Coast, stretching its boundaries from the Tasman Sea all the way up to the highest peaks of New Zealand. It offers perhaps the most contrasting, wild and breathtaking scenery. From rugged coastline with endless and secluded pristine beaches through lagoons, valleys filled with wild rivers and creeks, prehistorical lakes, wetlands, lush rainforests and up to mountain ranges of the Southern Alps with its highest mountain of the whole Austral-Asia - Aoraki Mt. Cook 3724m asl. And we can't forget the main draw card of this region - the mighty glaciers. Franz Josef and Fox Glaciers are extremely unique and, along with a couple of other glaciers in Argentina and Chile, they are considered among the fastest moving glaciers in the world. They can move up to 5m/day at places if conditions are right. Due to their geographical location they belong to a group of so called "temperate glaciers" since they slide their way down into the temperate rainforest to an altitude of around 250m asl, from the heights of almost 3000m asl and on a stretch of just 10 km. Start: pre-determined time and place in the afternoon in Franz Josef Glacier, well before our first sunset session. 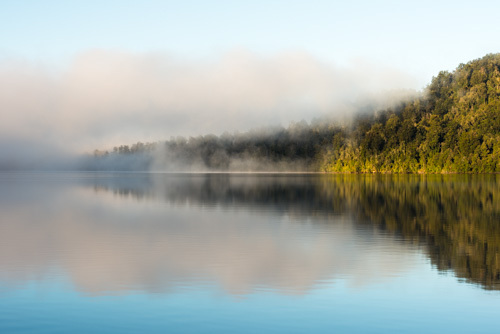 Our first sunrise will be photographed at nearby Lake Mapourika, with good chances of having morning fog at the lake. After breakfast, we'll venture into Franz Josef Glacier valley before, after lunch in town, heading north to Whataroa Valley with its beautiful, turquoise coloured waters of Whataroa River. Stunning, open views of the Southern Alps will decorate the background. Open valley may be occupied with grazing live stock, only to add an extra and typical West Coast element to the frame. This valley, one of the most beautiful valleys on the West Coast, is penetrated with side creeks and streams flowing into the bouldery Whataroa River, offering an endless photo opportunities. 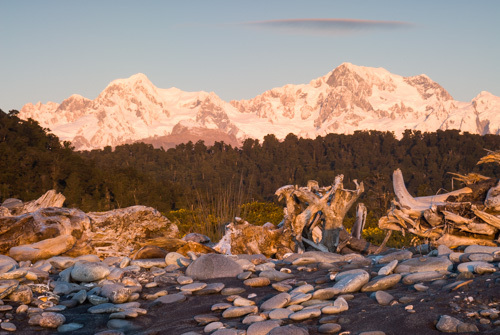 To capture colours of sunset, we'll move to 20min away Okarito and set off for 30 min hike to the lookout for amazing views of the Southern Alps. After sunset, we'll walk back in dark – head torches necessary and then it's only 30min drive to Franz Josef Glacier for the late dinner. 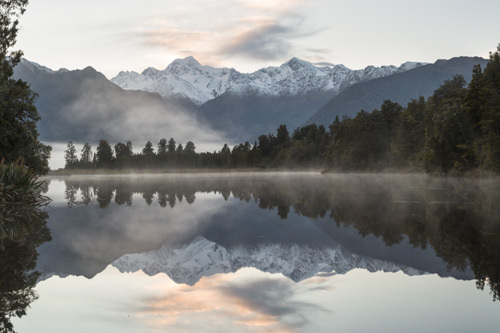 Early morning with sunrise at the most photographed lake in NZ - Lake Matheson and its mirror like reflections of NZ highest peaks - Aoraki Mt. Cook (3.724m) and Mt. Tasman (3.497m) After breakfast we move into the Fox Glacier valley, which is only a few minutes away. Lunch will be back in Fox Glacier township. There will be a little free time before we start making our way towards Gillespies Beach for some great sunset. The beach full of driftwood and Gillespies Lagoon will ofer us many amazing photo opportunities before sun gets down. Driving back to Franz Josef Glacier for the night. If the weather cooperate today, you'll have an option of photographing Fox Glacier itself. 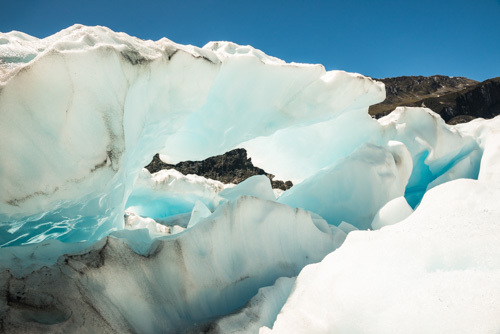 Depending on weather, we may go for a helicopter ride which would take us into icy wonderland of Fox Glacier higher up to be professionally guided by glacier guide. After landing in approx. middle of the glacier, right under the massive icefall, you'll spend on the ice about 2hrs, after which the helicopter will bring you all back to town. You will all be hipped up and it will be hard to beat this experience. This addition is optional, not included in tour fees and will be decided once in the area. At this point we have several options which I’d like to leave open and make decisions in accordance with weather. 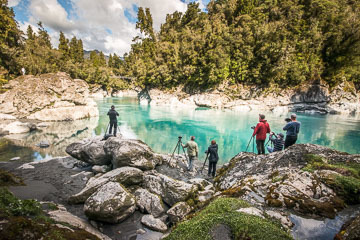 We may photograph Fox River with majestic Southern Alps and Fox Glacier in background or we may explore densely in moss cloaked rainforest before photographing sunset at Lake Matheson. The dinner will be in Fox Glacier with night in Franz Josef. End of tour after return to Franz Josef Glacier. The weather in Glacier Country can be extremely changeable. We are not going to be shooting in pouring heavy rain, but it is well possible that some rain will get us on our way to or from the location. Due to the geographical location of New Zealand, the weather can be extremely changeable – in the Glacier Country in particular, and will play a major role on our tour. For this reasons and other specifics of this tour, this itinerary is flexible and fully subject to change. 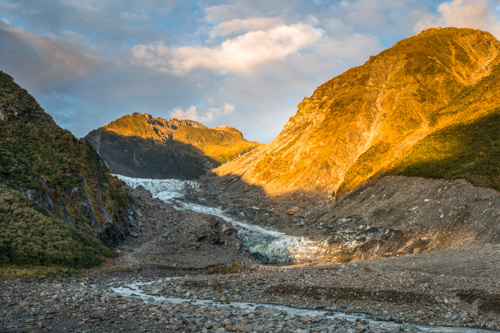 There is no pick up transport included for this tour and participants are expected to arrive to the Franz Josef Glacier location for the start of the tour. However, the pick up, as well as the transport throughout the workshop can be organised for you, if you'd required it. In an effort to secure as good weather as possible for this tour, we decided not to exactly specify and book the dates; rather we've decided to select one week in which the 3.5 days of our tour will take place. This solution should give us much better chances of catching the best weather window for our photography and make the tour in this wild but truly spectacular location a great success. Since we will be in contact with you before, or, and as soon as you arrive to New Zealand, we will keep you well informed and updated with weather situation. This way you will be able to adjust the time of your arrival to Franz Josef Glacier in best available weather window for the Glacier Country. We would be happy to advise and help you with booking the rental car, your plans and accommodation for the shoulder days around the tour, should you need our assistance. 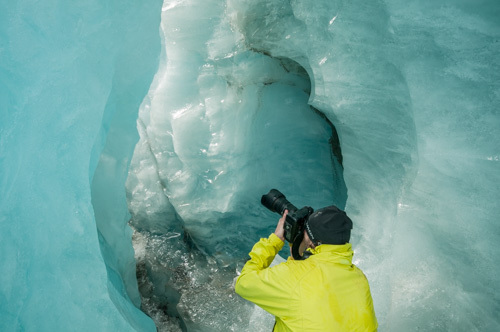 Once in Glacier Country, we will continually be assessing the weather conditions on daily basis and alter the tour to the benefits of the photography. These possible changes will be made by us in the mornings and during the day's development. The Glacier Country region is arguably, the most diverse area for New Zealand landscapes, offering many alternative location. Expect packed up days of the workshop, from the sunrise till after the sunset. 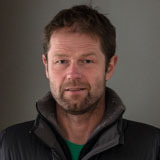 Sessions on RAW workflow, Adobe Lightroom and Photoshop will be inserted into evenings or into any suitable time window.